A virtual keypad for your Elecraft KX3. With 54 buttons and 5 switches completely customizable, you’ll be able to create the perfect keypad for you ham radio operations with the Elecraft KX3. Each button has its label, command and color. Each switch has two labels (on/off), two commands (on/off) and a color. 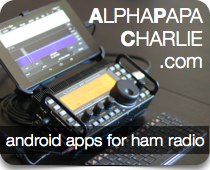 Commands have no length limit and use the Elecraft K3/KX3 programming language. The complete reference manual can be found here and is also linked inside the app, for handy reference. The app comes with two pre-defined templates: one for default operations and one for CW operators. But you can create new ones, customize the ones already available, save them and recall in a matter of seconds for infinite different setups. You’ll also be able to share/backup/restore your templates via email, dropbox or whatever is in you device share tab. The app works both on Android tablets and smartphones. A high resolution tablet is preferred for the high number of buttons available. To connect to the Elecraft KX3, you’ll need an OTG USB cable adapter that will allow you to use the USB Serial cable that comes with your radio. You can also connect the KX3 by using wireless serial devices like a Piglet.